Our original plans for today were to visit the Hofburg Palace (Imperial Apartments, Sisi Museum and Silver Cabinet) but we were both beginning to feel a little ‘historical sited out” and we are going to the Schonbrunn Palace tomorrow and the Belvedere on Tuesday so we just decided to head into the old centre of the city and see what we found. So it was back onto the trusty Line #1 Ubahn at the Hauptbahnhof and off at Stephansplatz – just one stop closer into the centre than yesterday. 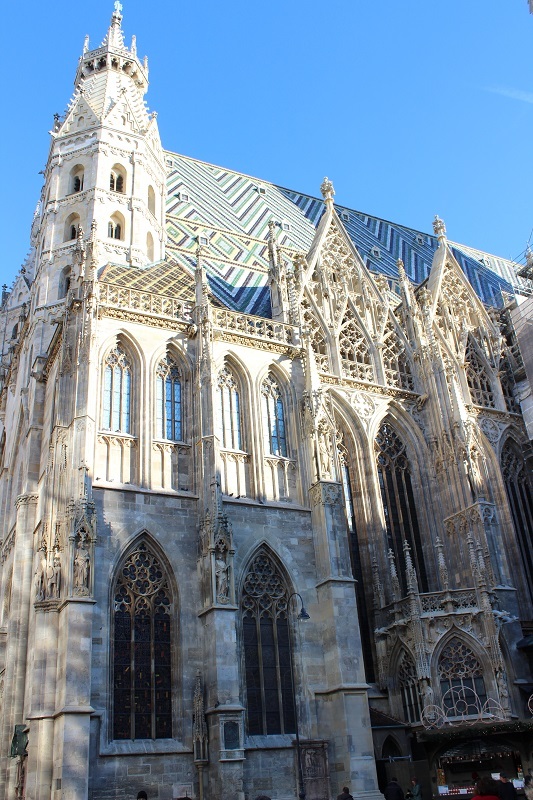 Stephans Dom (St Stephans) is incredibly beautiful outside – ornately tiled roof and carvings & statues outside that continue to amaze. Belonging to the Order of the Teutonic Knights it was originally built in the 14th century and restored in the 1720’s and again after WW2. Given it was both a Sunday and Christmas Eve it wasn’t surprising that access was very limited and we only got a little way in (along with the throng of others wanting to see inside). These photos are taken through the barrier erected to keep the great unwashed out of the main body of the church today. Outside, on the edge of the square is the ‘horse stop’ … much like a bus stop but this one is for gorgeous horse drawn carriages which the tourists flock to. The horses are beautiful and generally in matched pairs. From here we headed down Rotenturmstrasse towards the Danube. The river itself wasn’t blue but the sky was the most glorious winter blue. We stopped for lunch and I noticed what looked like a very plain church. Always one to venture in, I was not prepared for what awaited us. Truly one of those “OMG, I was NOT expecting THIS!” moments. St Peters Catholic church had the most ornate interior of any church we’ve come across. And, as an added bonus, an organ concert was scheduled to start shortly after we arrived. These two dirty little heathens sat for almost an hour and listened to the most incredible organ recital and gaped, open-mouthed at the incredible beauty of the interior of this stunning church. Back out onto the streets and we found ourselves at Michaelplatz with its recently unearthed Roman ruins sitting meekly in front of the grandiose entrance to the Hofburg Palace. We wandered through and into the massive courtyard with its statue of Kaiser Franz I, past the Austrian National Library with the Prince Eugene statue and out onto the Ringstrasse again, directly opposite Maria-Theresian Platz Christmas Market. Turning right along the Ringstrasse we passed the formal Volksgarden (Peoples garden) with its rows of pleached trees and roses currently under their winter covers. Sunset and moon-rise coincided tonight and made for some really lovely photos. Back to the train and one last Chrsitmas Eve look at the lights along the Kartener Ring. Too late for Carols by Candlelight from Melbourne but we did have ham, cheese, olives, wine etc for dinner. Happy Christmas from Vienna.